Extending nearly 1.2 million square miles across Belarus and Poland, the 7,000 year old Białowieża Forest is home to more than 12,000 distinct species of plants and animals. Comprising the largest, and one of the last holdouts of, primeval forest in Europe, the Białowieża has been designated a World Heritage Site and a Biosphere Reserve by the United Nations. 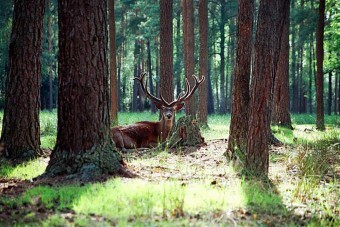 As it straddles them both, Poland and Belarus each play a large role in protecting the forest. 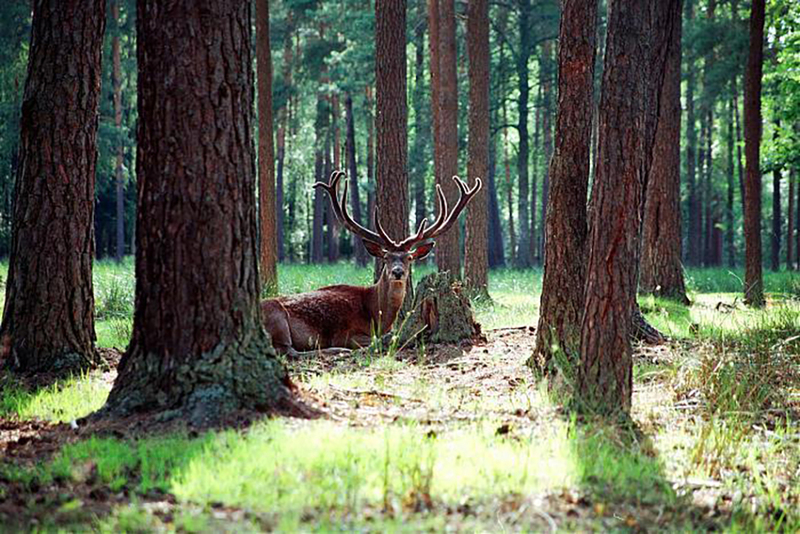 On the Polish side, the territory has been designated as the Białowieża National Park, while in Belarus, it is protected under the name of Belovezhskaya Pushcha National Park. Open to the public, well over 100,000 people visit the old forest each year. As you might expect given it’s still around today, protecting the forest is a very old tradition. As far back as the 1300s, hunting rights were being limited, and in 1538, King Sigmund I imposed the penalty of death upon anyone who poached a bison in the region. By 1541, it was declared a bison preserve, and in 1557, the first charter was issued establishing a board of overseers. By royal decree in 1639, all peasants in the forest who agreed to care for it were set free and became exempt from all taxes. In the 18th and 19th centuries, when Russia, Prussia and Austria divvied up Poland amongst themselves, the tsars began meddling with the Białowieża and its people. Hunters were allowed into the forest and the population of bison dropped by 3/5 in just 15 years; in response, Tsar Alexander re-instituted the reserve, and within a few decades, the bison population had rebounded. At one point, Tsar Alexander II instituted a program to rid the forest of predators, and lynx, bears and wolves were all hunted to extinction. During World War I, all of the forest’s bison were killed by German and Soviet soldiers, as well as poachers, and the ancient forest remained unprotected until 1921, when it was again declared a national reserve, and its bison stock was re-populated from zoo animals. During World War II some vainly sought refuge in the forest, and the graves of those killed by the German Gestapo can still be seen there. Home to some of the oldest trees in Europe, many of Białowieża’s oaks have names including Great Mamamuszi (112 feet), The King of Nieznanowo (125 feet), Emperor of the South (130 feet) and The Guardian of Zwierzyniec (121 feet). Notably, strategic and highly regulated logging is permitted in much of the forest. Most of the fruits of that labor are used locally for building and heating. In addition to its majestic old growth, the Biłowieża also boasts river valleys, wetlands and meadows that together support a collection of complex food webs. Large carnivores have returned and include wolves and lynx as well as otters. In addition, 56 other mammal species, 13 types of amphibians, 7 reptile species and over 250 kinds of birds inhabit the site. Among the forest’s birds, there are 8 different species of woodpecker. Beaver are also active in the Białowieża, to the point that every 6 or 7 years, their work reshapes the landscape. Notably, the bison herd that had to be re-introduced after World War I now boasts more than 900 members. One of the most remarkable facts about the forest, however, is that it is home to 12,000+ distinct invertebrate species, over half of which inhabit decaying logs on the forest’s floor. Notably, the forest also boasts 1,500 species of fungus including tinder, tinder polypore, ice man and hoof. Together, they work slowly on the rotting wood, such that it can take 40 years for a single log to be consumed. The strong protection provided to the Białowieża is necessary to preserve many threatened plants and animals, including four species of eagle: Golden, Greater Spotted, Booted and Lesser Spotted. Other forest species at risk include the Dwarf, River and Silver Birches, the Eurasian Elk, Beaver, Otter and Eagle-owl, the Norway Maple, the Grey Wolf, the Red Deer, White and Black Storks, the Lynx, the Grey and Swamp Willows, the Pedunculate Oak and the Wild Boar. The oldest known non-cloned tree is a 5,000-year old unnamed bristlecone pine found in the White Mountains of California; its neighbor, Methuselah, a nearly 4,900 year old bristlecone pine in the Inyo National Forest in California, held the title until 2013. The 4,000 year old Llangernyw Yew in Wales is, remarkably, still growing, and the oldest tree east of the Mississippi is a 3,500-year-old cypress named The Senator who resides in Florida. All of these are babies compared with the 9,550-year-old Spruce Gran Picea of Sweden, which is a clone that was produced from the same root branch shared with many others over millennia. The granddaddy of all, the oldest living thing in the world, is Siberian bacteria found in an ice core; these microbes are somewhere between 400,000 and 600,000 years old. We live in Nothern California and pass as much time possible in the old growth redwood forests of Mendocino & Humbolt Counties. Absolutely loved reading about your beautiful forests in Eastern Europe. Most likely on our way to enjoy next year.